Today I have for you Tempest from Mentality. 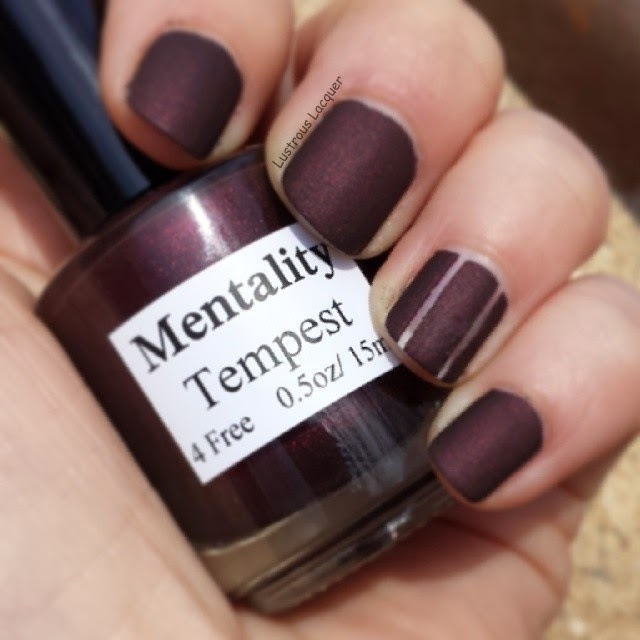 Tempest is from the Ombre Mattes Collection and is a blackened dark red with red shimmer. I was lucky enough to snag this beauty from a blog sale. The application process was smooth. I didn't experience any dragging like I have with other matte polishes. However, as you will notice the shimmer is hard to see once the polish dries. All pictures shown are 2 coats. I love the look of Tempest matte but wanted to see if I could get some more of the shimmer to show with top coat. You can start to get a glimpse of the depth that Mentality has with the addition of topcoat. Here's a Macro shot for a closer look. And now to share with you the reason for those 2 stripes on my ring finger. I decided to do some negative space nail art inspired by LacquerStyle. You can see her manicure here. This is my version. I used Essie Shine of the Times for my flakey strip and then topped everything off with a matte top coat. I really like how this turned out. It felt elegant and fun at the same time. I have a few more Mentality polishes on my wishlist but would love to hear some of your favorites or must haves. Thanks for stopping by and Happy Polishing! What a deep rich color. Looks good. Thanks Lisa. When I wore this I didnt want to take it off. Im going to have to do another one of these manicures in the near future. At first glance I thought you'd added a strip of foil - the flakie is really captivating! Thank you. I fell in love with the look the firt time I saw it. Such an easy way to dress up a manicure. Tempest is such a beauty! I heard so many people talking about how beautiful it was that when I saw it in a blog sale I snatched it up as quickly as I could. I didn't even really know what it looked like, just knew that I had to have it.